The Vienna State Opera has let it be known that Fedor Rudin, 26, has won its vacant concertmaster position. He will also be concertmaster of the Vienna Philharmonic for a probation period of up to two years. Born in Moscow, Rudin was raised in Paris, studied with Zakhar Bron and Boris Kuschnir and winning solo dates around the world. He also has conducting ambitions. He will replace Jose Maria Blumenschein in September. The three other concertmasters are Rainer Honeck, Volkhard Steude and Albena Danailova. I am very happy for him! And in case anyone needs their memory prodded, in The Mendtchaik Madman’s Jeremiad to the Indy violin competition which Norman posted a link to, Mendtchaik took Indy to task that Mr. Rudin did not advance to the finals. His Poulenc sonata was true artistry. So, if all goes well, Mr. Rudin will find a nice place to live and supportive colleagues and in a few years have no doubt that a steady paycheck and controlled conditions for performances have much to offer compared to living out of a suitcase and being at the mercy of committees that don’t always have a clue as to what they are listening to. Too many orchestra committees judge soloists by how loud and long the applause was, not realizing that some concertos end with the musical equivalent of a flashing “APPLAUSE” sign, while others trail off and leave you with your own thoughts and feelings. Congratulations!! He’s obviously a fine violinist. Look forward to hearing his work. Awesome news! Congrats to him! But I have to say that I’m very scared of his conducting ambitios. I’m afraid that he would be maybe 5-10 years in orchestra and then he leave to pursuing solo or conducting career. And my opinion is that if you are 1st concertmaster in one of Europe’s top 3 orchestras – you will be stay for that position for your rest of your life (like he’s predecessor Mr. Kühl did) – except health reason etc. The Wiener Philharmoniker’s current senior concertmaster, Rainer Honeck, has been conducting on the side for years. The prior senior concertmaster’s name is Rainer Küchl, btw. He is currently a 3rd year conducting student at the Universität for Musik and darstelle Kunst Wien (MDW) studying with Prof. Pironkoff. It is a very demanding program and I don’t see why someone without serious conducting aspirations would go through such difficult study program. He will for sure learn a lot working as concertmaster of these two top orchestras. Huh, studied with Kuschnir and Bron. Perhaps their skill sets are not limited to allegedly fixing competitions? Just a thought. Good news. I hope his conducting ambitions can wait & he lasts much longer in this position than the last guy. Surely “Vienna has a russian concertmaster” would be closest to the reality..? Not really. He holds both, French and Russian citizenship and mostly refers to himself as “Franco-Russian” or simply as “French”. I think we can let “Vienna has a French Concertmaster” stand as it is. Just listened to his Paganini 5th Caprice on You Tube. Well worth checking out. Stunning playing with the original bowing plus some nicely judged variants. One of the comments rightly asks if Paganini himself could have played this any better. I must agree. And I speak from the perspective of a record producer who reissued an o.o.p. Ruggiero Ricci master tape of music inspired by Paganini, from Chopin to Milstein. 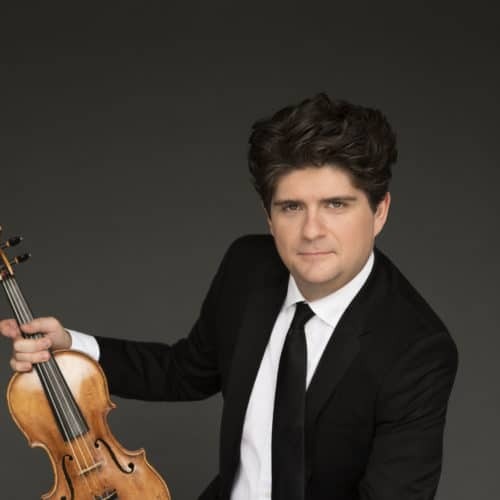 And let’s not forget that young master Rudin failed to be advanced to the finals of the most recent Indianapolis violin competition!